A master criminal is helped to escape from prison by the very man who has been hunting him down and then uses his powers of disguise to become a respectable representative of law and order while his foe languishes behind bars. 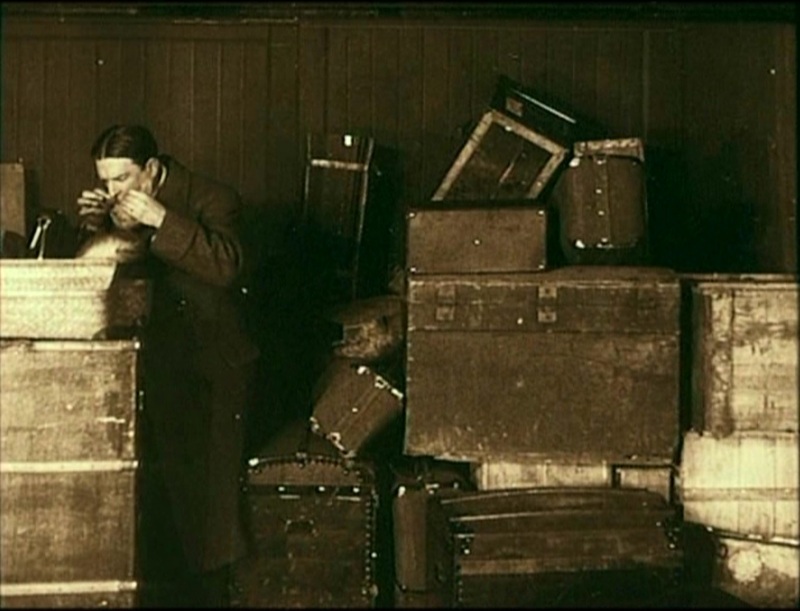 This final installment in the famed serial by Louis Feuillade is an exercise in reversals, deception, and brilliantly tortured logic. At the beginning of the movie, Fantômas is incarcerated in a Belgian prison at Louvain, but that doesn’t stop his gang from robbing a Marquis who tries to sell his wife’s jewels. The gang gets away with the jewels and the proposed payment, an amount totaling 500,000 francs. Juve is convinced that Fantômas will remain a menace until he is caught by the French police and executed for his crimes, so he hatches a plan to help Fantômas escape! He visits Belgium in the guise of an Austrian inspector of prisons and smuggles in a prison guard’s uniform for him to wear, then takes his place while Fantômas lets himself out of the prison. Fantômas, not knowing who his benefactor was, takes no chances on the way home. He takes a side-trip to England, where he gives the policemen on his tail the slip, and manages to accost and kill a French Magistrate in a baggage car. Since he now has access to his makeup kit, Fantômas disguises himself like the Magistrate and takes his place in the city of Saint-Calais. Here, he contacts his gang and finds out that they have hidden the jewels in the local church. Fantômas intercepts a letter from the Marquise (the Marquis’s wife) to her lover, saying that she hopes to be free to remarry soon, and he uses this knowledge to frame her for the Marquis’s murder when he inhales gas from the heater in his room during a nap. He blackmails her and tells her to bring him another 500,000 francs. Now, he goes to retrieve the jewels, which are in a bell tower. He sends his henchman up to get them out, then snatches away the ladder, leaving the man trapped in the bell. But, Fantômas discovers that the jewels were not in the case that had been tossed to him. Not a man to trust. At the Marquis’s funeral, of course, the church bells are rung, and the congregation gets a surprise: “Pearls, diamonds, blood…” rain down from the bell tower. Because of his trusted position, the jewels are turned over to the Magistrate. He is also able to get the cash, which he knows that his lackey has turned over to the Marquise’s maid, by having her hauled in on a false charge and searched by the police. 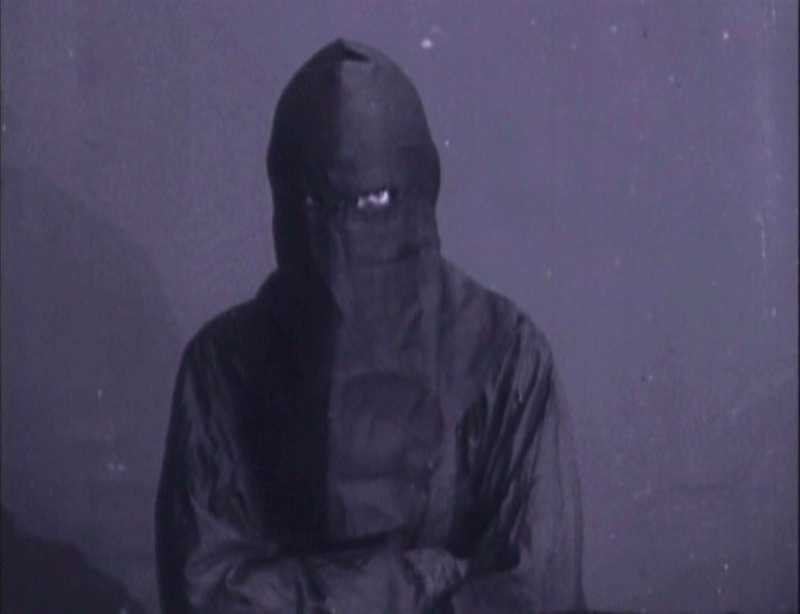 At this point, Fandor the journalist has shown up and he quickly finds a clue to Fantômas’s identity. He arranges for the man in Louvain prison to be extradited to Saint-Calais (evidently Juve has been in prison all this time – that’s dedication for you!). 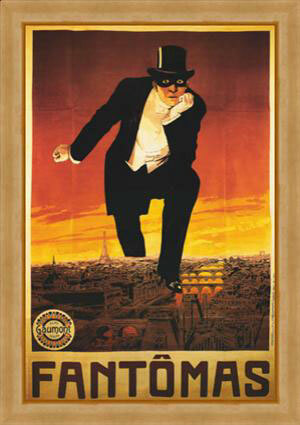 Fantômas tries to have his henchmen kill Juve, but they are tricked by Fandor and arrested. Fantômas the Magistrate has no choice but to sentence them. However, he gets his blackmail money shortly thereafter and is ready to make his escape, but the prosecutor, having met with Juve, now orders that he stay in his office. 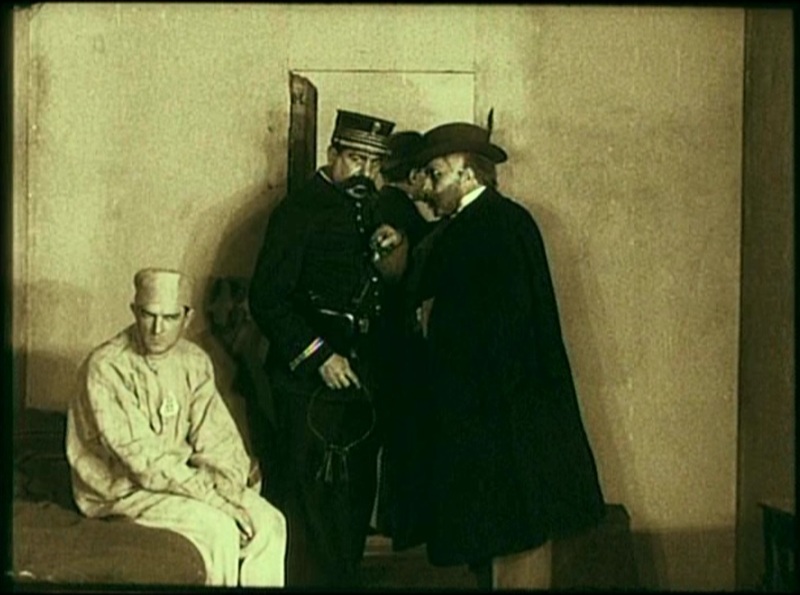 Fantômas summons the head of the prison and gives him a secret order. Then he takes off his disguise and confronts Juve. Juve has him arrested; however at midnight the warden releases him, in line with the orders he received from the Magsitrate, which affirm that the man held as Fantômas is really Inspector Juve! And so the series ends as it begins, with Fantômas on the loose once again. This movie is different from the other Fantômas episodes in one notable way: it is truly Fantômas’s movie. We see Juve only briefly at the beginning and end, and there’s even less for Fandor to do. The emphasis has shifted entirely away from the pursuit of Fantômas to the pleasure of watching him unfold and enact his bizarre and brilliant plans. And yet he is never truly successful – the money he worked so hard to steal is recovered at the end – although of course he thwarts the law’s desire to protect society from his return. At no point during this movie does Fantômas don his famous black mask, which is interesting as well. He is visible to us, and thus possible for us to identify with, throughout the film. René Navarre, the actor who portrays him, also shows off his makeup skills in the Magistrate-disguise, but you can still recognize his distinctive nose and some idiosyncratic body language when he plays the part. Fantômas is human to us, at least, throughout the film. The other fascinating part of this movie is the reversals I mentioned at the outset. Throughout this series, there has been a changing of roles: is Juve the hunter or the hunted, Fantômas the pursuer or the pursued? But now this has been taken to a new extreme: Fantômas becomes the enforcer of law while Juve is held in prison. Wonderful! It was exactly this kind of subversion of the concepts of authority and identity that made this series, as well as the novels it was based upon, beloved of the Surrealists in later years. There’s an element of this in Fantômas’s original escape as well: none of the guards notice that he’s the man they’ve been guarding as he walks out of the prison, they don’t even look at his face, all they see is the uniform of a guard. Meanwhile, no one notices that Juve, in the cell, looks nothing like the man they had there yesterday: they don’t look at him either, only the uniform of the prisoner. I began reviewing the Fantômas series only a few short weeks after starting this blog, over two years ago. I have since come to love it as one of my favorite discoveries during the project, second perhaps only to Evgeni Bauer. Much of that is due to its exciting and original villain. The follow-up serial, “Les Vampires,” has been a disappointment to me, because it lacks a central villainous character as intriguing and charming as Fantômas: The Vampire gang just seems to consist of a crowd of wanna-be- Fantômases. It is rumored that René Navarre had difficulty going out after making these movies: people would recognize him and accuse him of being a criminal. Once again, identity and authority break down at the hands of the evil genius of cinema. 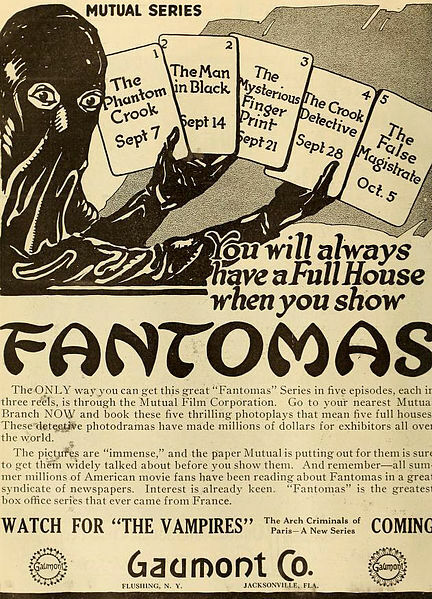 Crime has always been an important theme to narrative film: It’s central to “The Great Train Robbery,” not to mention “The Burglars.” Fantômas raised the art of crime for its own sake to a new height, one which screen villains still aspire to, more than a century since his first appearance. 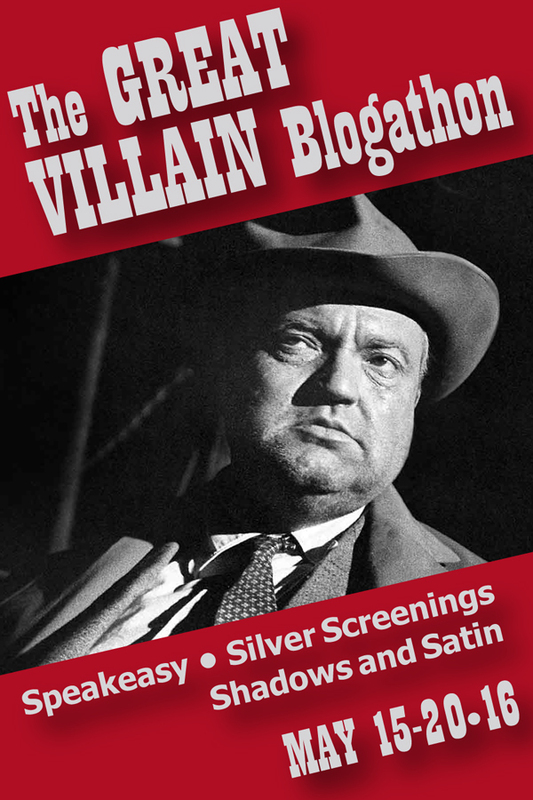 This has been my contribution to “The Great Villain Blogathon,” hosted by Speakeasy, Shadows & Satin, and Silver Screenings. Be sure to take a look at the other entries! I have not found this movie available for free online. If you do, please comment. If Fantomas has become a favourite of yours, then it’s something I must see. And if people thought René Navarre really was a criminal, then it must be well done indeed. Thank you for joining the Villain Blogathon, and for bringing this little known (to me) gem! My pleasure, and thank you for hosting as well! It’s very interesting how he goes from being an antagonist to become really the center of the film. I don’t know how true the story of people seeing Navarre as Fantomas really was, but it makes a good story! Enjoyed reading, I’ve always been curious to see Fantomas and Les Vampires. Looks great and thanks so much for being part of this blogathon! Thanks for hosting! Fantomas is endless fun.